When new users log in to list.it, they are going to want to build a few lists for themselves. Chances are, many of the lists they would want to create–to do lists, shopping lists and memos come to mind–are already defined in the portal. All the user has to do is create a new list, choose that pre-defined data type, and have at it! A number of data definitions ship with the portal to help you get started: To Do, Issues, Meeting Minutes and Contacts. Use these on their own to generate new data lists or tweak them to fit your use case. If none of the built-in data definitions suits your needs, you can define your own. Perhaps we want to allow our list.it users (who would probably call themselves “list-ers” or “list-ies”) to create their own data types for lists they create. In this case, they would need to have unfettered access to the content of their private user site where they can create a new data type. Using data lists to outline a new data model is as simple as point and click. You now have a list.it account and have been dying to bug your friends and family to sign up for “volunteer” work: helping you move into a new apartment. Using an intuitive visual editor, you can quickly draw up the skeleton for that volunteer list in minutes. Since data lists exemplify a unique type of content for your site, you can find them in the content section of the control panel, selecting Go To → Control Panel → Content → Dynamic Data Lists or Manage → Site Content → Dynamic Data Lists. Within the dynamic data lists section, you can either create a new data type (Manage Data Definitions) or a new list from an existing data type. Figure 9.1: Data Lists in the control panel. Boolean: presents a checkbox to the user and stores either a true (checked) or false (unchecked) based on state. Date: a preformatted text field that displays a convenient date picker to assist in selecting the desired date. The format for the date is governed by the current locale. Number: a text box that only accepts numbers as inputs, but puts no constraints on the kind of number entered. Integer: similar to Number, except that it constrains user input to non-fractional numbers. Decimal: similar to Number, except that it requires a decimal point (.) be present. Documents and Media: select an existing uploaded document to attach to the data record. File Upload: upload a document to attach to the data record. Uploads are stored in Documents and Media. Radio: presents the user with a list of options to choose from using radio button inputs. Values are stored as Strings. Similar to Select. 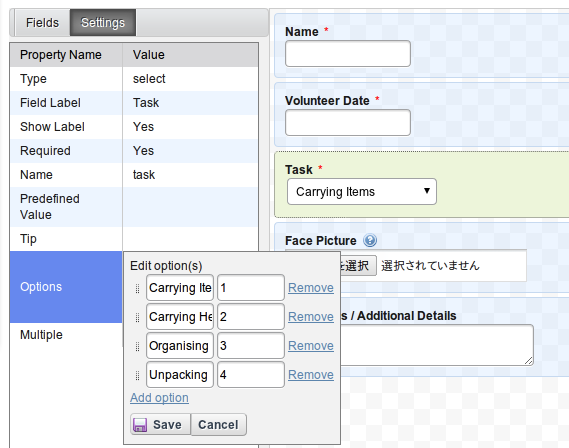 Select: a selection of options for the user to choose from using a combo box. Can be configured to allow multiple selections, unlike Radio. Text: a simple text field for any String input. Text Box: a large text box for long text input. Figure 9.2: Data definition fields. Using that reference as a nice cheat-sheet, you can now create the data type you need for “Volunteer Work Sign-Up.” Use a Text type for the name. For all the tasks your friends and family can volunteer to do for you, use Select (obviously set to allow multiple options). Finally, you don’t want to forget a File Upload so they can upload images of themselves. After all, how much more official-feeling and fun is it if you can print out some nifty badges? To add these fields, drag them from the palette on the left to the work area on the right. Type: Lists the type of field placed in the definition. This is not editable but is available to reference from a list template. Field Label: Sets the text that can be displayed with the field. This is the human-readable text that the user sees. Show Label: When set to Yes, the label is shown with the form field. Required: When set to Yes, this field must have data in it for a new entry to be submitted. Name: The name of the field internally, automatically generated. Since this is the variable name that you can read the data from in a list template, you should give a more memorable name here. Predefined value: If you would like example data or a default value for the user to start with, enter it here. The field’s value defaults to this when adding a new entry. Tip: Each field can have a small help icon, with a tooltip attached that displays helpful information. If you would like to provide text for the tooltip you may enter it here. Multiple (Select): When set to Yes, allows the user to select more than one option. This defaults to no. Allowed File Extensions (File Upload): By default, form validation accepts any file type to be submitted. Set this value to a comma-delimited list of extensions, including the character ., and Liferay checks the extension before the file can be uploaded. 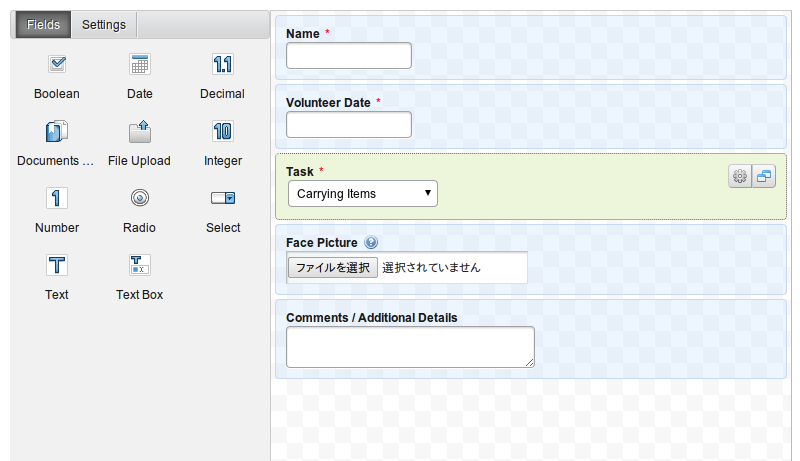 Width (Text, Text Box, Decimal, Integer, Number): Sets the visual width of the form on the page. It does not affect the values that are stored. Possible values are Small, Medium and Large. Figure 9.3: Data field properties. In addition to dragging the fields around to create your desired forms, you can stack inputs within inputs by dragging a field within another field. You can organize your data into unlimited levels of hierarchy, creating the clearest, most logical data model. There is also a duplicate button on each field (the middle button), allowing you to easily clone any field as many times as you need. That really covers the basic tools that users of list.it need to get rolling with an unlimited array of custom types. Plus, you can always come back and change your form. If you find you needed to add some more information, simply come back to the data definition and fix it. All your data lists that use it are then instantly updated with the new or changed fields. All that’s left to do is build a new data list and let your users play with it.